A BMP-3F marines fighting vehicle of the Indonesian Marines. A model of the BMP-3F marines fighting vehicle on display. The BMP-3F marines fighting vehicle has a speed of 10km/h on water. A rear view of the BMP-3F marines fighting vehicle. Image courtesy of Rostec. BMP-3F from Kurganmashzavod JSC is a marines fighting vehicle developed specifically for the marine forces and quick reaction forces. The vehicle offers superior fire power, mobility and protection for the amphibious troops to conduct sustained assault missions. The BMP-3F vehicles can be deployed by marine units, and border and coastal defence troops for conducting combat missions in the coastal zones. The vehicles also carry troops and supplies from ship to shore. Indonesia and Russia made an intergovernmental agreement for the supply of BMP-3F vehicles to the Indonesian Navy, in September 2007. The first batch of 17 vehicles under the agreement arrived at an Indonesian main naval base in the Javanese city of Surabaya in November 2010 and was delivered to the Indonesian Navy in December 2010. The Ministry of Defence of the Republic of Indonesia signed a $114m contract with Russian state-owned arms exporter Rosoboronexport for 37 more BMP-3F vehicles in May 2012. 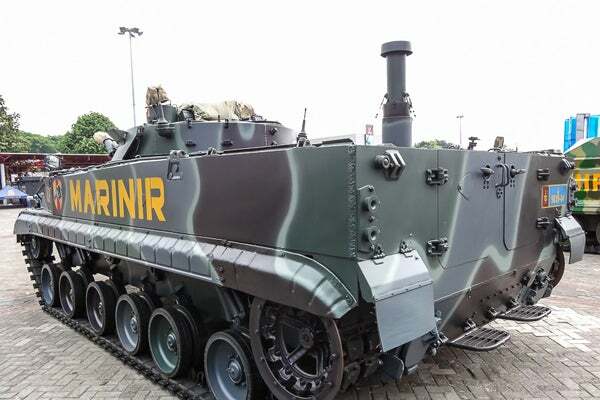 The vehicles were handed over to the Indonesian armed forces in January 2014. The Seafox is a mine disposal unmanned underwater vehicle (UUV) manufactured by Atlas Elektronik. The BMP-3F is the Marine’s fighter version derived from the BMP-3 infantry fighting vehicle (IFV). The design incorporates several modifications for increased swimming characteristics and stabilisation. The vehicle lacks self-entrenching device, and features anti-surge vane and an air intake tube. The vehicle is capable of operating at sea state three and can fire onboard weapons with necessary accuracy at sea state two. The amphibious design ensures missions under rough sea conditions and allows for the towing of the same-type vehicle. The BMP-3F is operated by a crew of three and accommodates seven soldiers. The 18.7t vehicle has a length of 7.14m, width of 3.5m and height of 2.5m. The BMP-3F is armed with a semi-automatic 100mm 2A70 gun/missile launcher, a 30mm 2A72 automatic gun and a 7.62mm PKTM coaxial machine gun installed on the common mount. The 100mm launcher can fire high explosive fragmentations rounds or anti-tank guided missiles (ATGMs). The all-welded aluminium armoured hull and turret protects the occupants from small arms fire and shell splinters. The vehicle is also fitted with spaced armour as a standard specification. The survivability is further enhanced by 902V smoke grenade launch system Shtora-1 protection system or Arena-E defensive aids suite. The advanced Fire Control System (FCS) of BMP-3F effectively engages aerial and land-based targets during day and night. The gunner is offered with a new SOZH main sight with an integrated laser range finder, while air defence sights are provided for gunner and commander. The FCS also integrates TKN-AI commander’s vision device and a ballistic computer. "The advanced Fire Control System of BMP-3F effectively engages aerial and land-based targets during day and night." The sight eyepiece of SOZH gunner’s sight shows the ammunition type, distance to target and ready-to-fire sign, and also provides an ATGM guidance channel. The turret of the BMP-3F can be fitted with Vesna-K and Eagle Eye sighting system based on the customer requirements. The BMP-3F is equipped with an UTD-29M liquid cooled diesel engine coupled to a hydro mechanical transmission with four forward gears and one reverse gear. The engine develops a power output of 450hp and ensures a road speed of 72km/h. The vehicle has a maximum range of 600km on land. The water jet propellers mounted to the rear of the hull allow the vehicle to sail at a speed of 10km/h on water. The vehicle can operate continuously in water for seven hours with the running engine. This project forms part of our recent analysis and forecasts of the global armoured and counter-IED vehicle market available from our business information platform Strategic Defence Intelligence. For more information click here or contact us: EMEA: +44 20 7936 6783; Americas: +1 415 439 4914; Asia Pacific: +61 2 9947 9709 or via email.